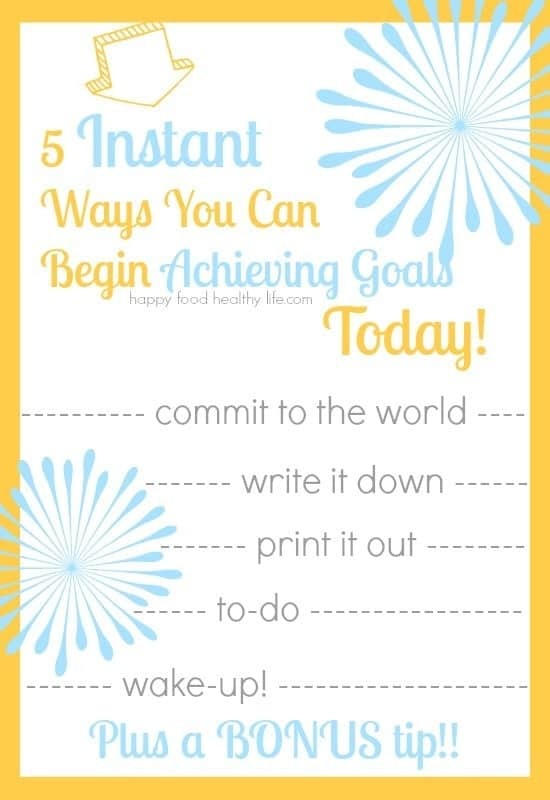 5 Instant Ways You Can Begin Achieving Goals Today! Sometimes, the act of achieving goals, especially your health goals, can be a really overwhelming process. You may not know exactly where to start. Your past failures may be getting you down. You just aren’t feeling 100% sure about what steps need to be taken in order to actually start, follow through, and stick with it. I’ve come up with five instant things that you can do to kickstart your progress on achieving your goals TODAY! They’re easy (relatively), they’re pretty quick. And they will get you started today. No waiting until the next Monday. No waiting on the stars to align. No special materials needed. Just get going right here and now. 1. Write down one goal to focus on. Just one. Nothing crazy. Something obtainable. Something that you know you can do. Write it down, and write the complete details and a date you want to achieve it by. 2. Commit publicly. That’s right. Tell everyone about it. Write it on Facebook. Call your best friend and tell her about it. Get excited and tell your husband or wife. The more people you tell, the less chance of you failing. It’s very hard to go back to all of those people and tell them you just couldn’t do it! 3. Print it out. Post it up. So you’ve written your goal down somewhere. You can either use that piece of paper, or you can do something even more grand and make it all pretty with markers, pretty fonts, and glitter. Regardless, you need to be able to have this goal posted in places you will see often. On your bathroom mirror. On the fridge. By your computer. In your car. Wherever. You want to constantly be reminded of this commitment you have made to yourself to begin achieving goals. 4. Get in the habit of making a to-do list. Yup, a to-do list. You can make more than one. One that lists everything you need to do in order to reach your goal. And then another one that is just for one day or week. This will help you to feel less overwhelmed and allow yourself to take active steps toward achieving goals. 5. Wake up earlier. Unfortunately, there’s this one. But it could really make a huge difference in whether or now you reach your goals. For me, my most productive time is when everyone in the house is still sleeping. No distractions, no outside forces pulling me away. Just me working on my goals and the little tasks on my to-do list that will help me to reach those goals. 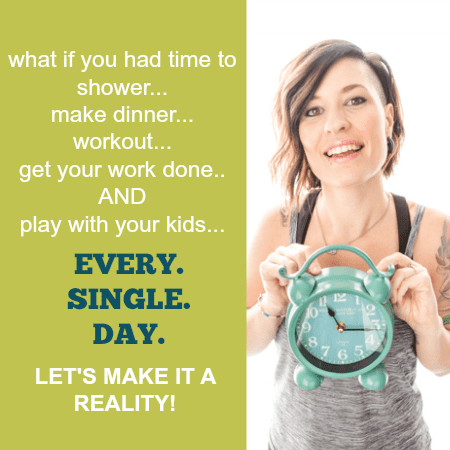 When it comes to goals, every little bit counts, and sometimes, just adding an extra hour to your day can help you to reach those goals quicker! Bonus: Make a “Ta-Da” list! And here’s your bonus tip: Make a Ta-Da List! That’s right. I learned this trick from Meg Johnson, a wonderfully inspirational speaker. At the end of the day, maybe you haven’t achieved everything (or even anything!) that you wanted to achieve. But I’m sure there is plenty that you did do. Write it all down. Write everything that you did achieve. So instead of the day that you felt didn’t go right, you have something to show for it. You have that list of amazing “ta-da” moments. Whether it was soothing your baby while she’s teething, running errands for a friend in need, or just getting the rest that your body was craving, those were achievements in your world, and they are all worth celebrating. Although your goals are important, it’s also important to remember that not every day will go as planned, and some times you just have to celebrate the other life achievements! I hope these little quick and easy tips help you get closer to reaching your goals. I strive to make this an easy process for you, and I want to create something that will be easy and completely do-able for you. Do you have a goal you’ve been putting it off? What’s stopping you from starting with one of these steps today? Because I care so much about your success and truly want you to reach your goals, I have created a no-fail guide to success. This is a plan you can easily customize to your lifestyle. It can work for absolutely every person, so there should be no excuses. Click here now to get your copy! One of my secret productivity tips is getting up early. I can get so much done in the two hours before the rest of the world is up and going! I also love the tip about writing your goal down. Study after study shows that the likelihood of accomplishing your goal skyrockets when you write it down. Thanks for the great post! I’m off to work on my goals!